Photography books consisting of found snapshot collections (also referred to as “vernacular photography”) are popular to publish these past few years. Perhaps one reason for an increased interest in antique snapshot collecting (and subsequent books of them) is due to the fact that the pixel- based replacement is less likely to get printed or shown outside of the computer. Unlike a digital file, physical snapshots of our past are singular analogue pieces that evidence our existence. They are personal documents that are lost, found and appropriated by strangers. In his first book “Strange and Singular” Michael Abrams combines his own found words and images to reexamine and recreate new meaning. The book’s title and layouts are inspired by a quote from philosopher Michel Foucault: “a readiness to find strange and singular what surrounds us; a certain relentlessness to break up our familiarities and to regard otherwise the same things; a fervor to grasp what is happening and what passes; a casualness in regard to the traditional hierarchies of the important and the essential”. Several other inspirational quotes on photography and life also accompany images in the book including those from Lisette Model, Nan Goldin, William Eggelston and Gertrude Stein. Photographs created by the average snap shot maker contain a presence and honesty recorded in the moment. Even though their meaning may not seem important, they are unique documents themselves – uninfluenced by a professional burden to create a perfectly composed image. With the intention to merely record a moment, spontaneity and surprise can occur– and collectors covet these images. The design of Abram’s book reflects the concept of discovery and mystery in vernacular photography. Hidden in its pages are loose original snapshots that reveal themselves unexpectedly. My copy contained three images, one of a newborn and his parents gazing at him adoringly in a wicker bassinet and two others of the same family in various poses. Handwritten text around one of the white image borders says “Bobby, February 1940 – three weeks old”. The preciousness of a ruffle edged historical snap shot with its monochromatic tint and hand written descriptions contribute to nostalgia for our past. However, Abram’s arrangement of photographs evoke more than that. The placement of discarded images into an intentional series paired with thoughtful quotes from some of the most famous photographers and philosophers of our time inspire us to reconsider our past, our personal archive and the importance of our own lives as document. 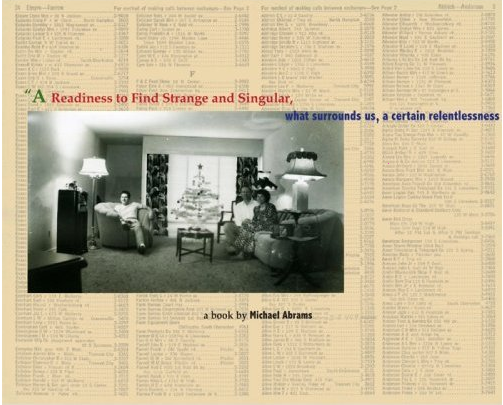 Order “Strange and Singular” by Michael Abrams through Fotovison’s Amazon.com book portal to help support Fotovision’s educational programming. 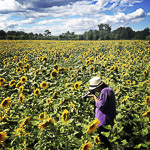 Next Post SPEWEST Student Photography Contest – $$$ in prizes!